I refer most wisdom tooth extractions to the oral surgeon, click here. Wisdom teeth, if present, don’t always erupt into the mouth, and when they don’t they are referred to as impacted. Wisdom teeth actually begin forming before age 10, and if they erupt it is usually between 17-21 years old (see Tooth Eruption Chart). Third molars usually erupt in the late teen years, which coincides with passage into adulthood and is referred to by some as the age of wisdom; hence “wisdom teeth“. How Are Wisdom Teeth Evaluated? Wisdom teeth are evaluated by oral examination and x-rays (usually a panoramic x-ray). We also review your medical history. The x-ray helps to determine the position of the tooth within the jaw and its relationship to nearby nerves and teeth. Problem does not necessarily mean pain. Most people do not experience pain with their wisdom teeth. Problems are more often silent and progress slowly. By the time a problem does become evident to a person, substantial damage has often already occurred. Specific problems include the following 14 concerns, some of which are more common, some are rare – each person is different and your concerns are determined with a thorough examination and evaluation. Of the problems wisdom teeth cause, the most common complaint associated with impacted wisdom teeth is pain. A person may have soreness or pain in the back part of the jaw, ear ache, sore throat or pain in the side of the face. The impacted wisdom tooth itself may be the source of the pain or there may be an infection associated it. Food and debris containing destructive bacteria may become trapped between the gum and the underlying wisdom tooth causing a painful infection around the crown of the wisdom tooth even though you don’t see the tooth. People may mistake repeated soreness of the gum tissue overlying the wisdom teeth as an effort by the teeth to erupt. Usually this is a warning sign of an infection. This generally happens because these partly erupted teeth are difficult to keep clean, and the accumulated food particles cause the gums around the tooth to get infected. If untreated by removing the wisdom tooth, the infection may cause destruction of the bone surrounding the wisdom tooth and will affect the neighboring tooth. In addition to affecting a neighboring tooth, the bacteria present around a wisdom tooth don’t just remain around that tooth, but spread to other teeth, so that the wisdom tooth actually becomes an incubation and re-inoculation source affecting other teeth. This chronic infection is now recognized to have an impact beyond merely oral health, and also has an impact on our general health and organ systems (see more click here). For people who have to premedicate before getting their teeth cleaned these bacteria pose a constant daily risk. For those with compromised immune systems, this chronic infection again poses a burden on their already taxed health (e.g. diabetes). It often happens that there is not enough space in the mouth for wisdom teeth to erupt. In such cases they may try to erupt in an abnormal direction, or may get locked into the jaw. This locking is known as impaction. The teeth remain completely buried in the bone of the upper and lower jaws in which they developed, a condition known as impaction. See below for Types Of Impactions. The same types of bacteria that are responsible for infections can also cause tooth decay or cavities in the impacted wisdom tooth and/or the root of the adjacent tooth. A wisdom tooth may decay unnoticed, as they are the most difficult teeth to keep clean, being so far back into the mouth. Just the constant pressure from the impacted wisdom tooth can also lead to destruction of the tooth next to it when the tooth is impacted mesioangular (see Types Of Impactions below). This is uncommon and occurs in less than two percent of those with impacted wisdom teeth. An impacted or erupting wisdom tooth can push on adjacent teeth, causing them to become more crooked. Current information shows that wisdom teeth do not alone cause teeth to become crowded and crooked, but they certainly can exacerbate existing crowding. 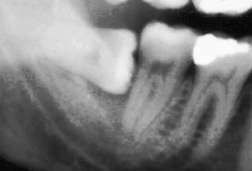 Although the overall occurrence of cysts and tumors associated with the jaws is low, when they do occur it is most frequently around an impacted wisdom tooth. 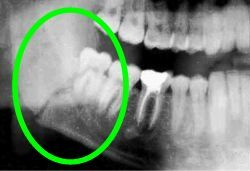 If the sac that holds the crown of the wisdom tooth remains in the bone, it can fill with fluid, forming a cyst that can destroy surrounding bone. These are rare. The flap of gum tissue, called an operculum, which partially covers an erupting wisdom tooth creates a place where bacteria which normally live in the mouth to flourish, multiply and cause an infection known as pericoronitis (inflammation around the crown of a tooth). Such an infection is felt as swelling and pain around the area. Sometimes the tooth is trying to erupt, but has not yet broken through the gums. When the upper tooth bites down onto this gum pain can be caused. If the infection worsens, it can become a serious infection. People may mistake repeated soreness of the gum tissue overlying the wisdom teeth as an effort by the teeth to erupt. Usually this is a warning sign of an infection. The presence of a wisdom tooth creates a potential for less strength in angle of the jaw. The decreased structural strength increases the potential for a jaw fracture. Although very rare, it is another consideration for the detriment of wisdom teeth. 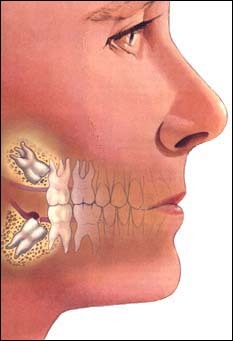 If wisdom teeth erupt into the mouth, their position frequently interferes with the harmonious movement of teeth. Over decades this destructive impact affects the wisdom tooth itself, but more importantly it puts stress and strain on the jaw joints and muscles of the jaw. This bite discrepancy can lead to headaches, muscle spasms and jaw joint problems. Wisdom teeth may cause movement of teeth (particularly the front teeth) when they try to erupt and this will compromise the orthodontic result. Additionally, it is difficult or impossible to achieve an ideal orthodontic result with wisdom teeth present. If a wisdom tooth erupts beneath a denture it will cause severe irritation and if removed, the person will need to have a new denture constructed as the shape of the gum will have changed. This is not a concern for most people, but if you are traveling for an extended time to an area where dental services are not available, wisdom teeth pose a different risk than for those with easy access to emergency care. Improvements in surgical technique and sedative medications allow people to have their wisdom teeth removed comfortably and efficiently in a pleasant environment. There are several anesthetic options available to optimize comfort during their surgery and minimize the postoperative side effects. The type of procedure performed will depend very much on specific nature of each wisdom tooth. The surgery may be carried out by a general dentist or by an oral surgeon, depending on the complexity of the operation. Whether a local or general anesthetic is used also depends to a large part on the difficulty of the operation. The addition of nitrous oxide (laughing gas) can be very helpful when local anesthetic alone is used. Surgery on the upper wisdom teeth is usually simpler than on the lower wisdom teeth, because upper jaw bone is not as dense. For teeth that are completely erupted, normal extraction procedures are followed. After effective local anesthesia is achieved, the tooth is loosed in its socket with a an instrument much like a shoehorn. People often have the impression that teeth are pulled out first, and this is not the case – they are loosened and elevated first, then they are grasped to remove them. It is sometimes less traumatic to section a wisdom tooth much as if it were impacted (see below) – each situation is determined by that particular tooth, and after consultation with you. Sutures may or may not be required. Conscious sedation is the technique to put you to “sleep”. Different than when you are in the hospital with general anesthesia, with conscious sedation you breathe on your own. With conscious sedation you have no awareness of the procedure, and you have local anesthetic as well. Most impacted teeth are removed with an IV anesthetic technique of conscious sedation (after medicines are given intravenously local anesthetic is also administered). The gum tissue is moved out of the way thereby exposing the tooth and the bone overlying it. The ideal is to use as little force as necessary, therefore any bone in the way will be carefully removed. This is done with a high speed cutting instrument under water irrigation (much like the drill used for fillings). After the tooth is exposed, it usually requires sectioning into pieces to be removed. Once again, as little force as necessary is used and with as little bone removal as possible. Sectioning the tooth accomplishes this goal and protects important surrounding and nearby structures (nerves and blood vessels). After the tooth is removed, the gum tissue is repositioned back into it’s proper place and sutured. Sutures are often dissolvable and do not require removal. If you do receive sutures that require removal, be sure to keep your appointed time for removal, so as not to cause swelling around the healing site. Anti-inflammatory drugs are sometimes injected into the area of the surgery to help reduce swelling. Most dentists agree that one surgery of all wisdom teeth is best and that multiple trips to the oral surgeon for the removal of wisdom teeth is not in the best interest of the person and although minimal, only raises the potential for complications. Additionally, one surgery means one post-operative healing, rather than multiple. People often wonder if there is some discomfort when one tooth extracted, that it would be many-fold for all four wisdom teeth, and that is not the reality. When a wisdom tooth is blocked from erupting, it is termed impacted (any tooth, baby tooth or permanent tooth can technically become impacted). Wisdom teeth can be impacted in the gum tissue overlying them. These are called soft tissue impactions. Unfortunately, for the person, soft tissue impactions often end up being more difficult than they sometimes appear because of the curvature of the roots that may not be apparent on the x-rays. Wisdom teeth more commonly are still enclosed in some bone. If they are fully enclosed they are referred to as full bony impactions. If only partially enclosed in bone, i.e. the wisdom tooth is partially erupted through the bone, these are referred to as partial bony impactions. 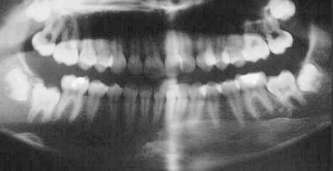 They are either partially exposed in the mouth or completely under the gum surface and identifiable only on an x-ray. Due to unavailability of space in the jaws, the impacted wisdom teeth grow in many different directions, commonly at an angle. The complexity of surgery depends on the type of impaction. Each wisdom tooth in a person’s mouth can erupt or be impacted differently – their position and eruption pattern is quite variable. A wisdom tooth may grow at an angle towards your other teeth. This type of impaction is called as a mesioangular impaction. A wisdom tooth which erupts at an angle away from your other teeth is said to be distoangularly impacted. A wisdom tooth facing your other teeth horizontally is said to be horizontally impacted. 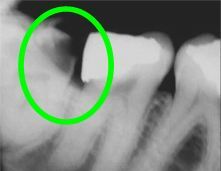 A tooth which is in normal direction but still unable to erupt due to lack of space is said to be vertically impacted. When it is obvious that the wisdom teeth will become impacted, they should be removed. This decision can be made often by the time the person is fifteen years of age. Removal of impacted wisdom teeth in this age group has distinct advantages. At this age the roots are seldom fully formed, even though the tooth has become impacted. Removing an impacted wisdom tooth before the roots are fully formed is usually less traumatic for the person. Typically, people having impacted wisdom teeth removed in their mid-teens have a more rapid recovery and have a shorter and less complicated post-operative course. Most people experience minimal disruption of their normal routines, and time off from work or school is usually minimal. The degree of difficulty and post-operative complications increase with age. It is easy to understand why many people choose to be proactive and have their wisdom teeth extracted while they are young and healthy rather than have to undergo a more extensive surgical procedure later in life when their recovery may not be as easy and their general state of health may not be as good. Normal extraction instructions apply, click here for those. How is my mouth held open during surgery when I’m asleep? A small cushion is placed between your teeth, and this holds your mouth open. Every individual has a different healing response to surgery, but on average there is not much disruption of one’s activities, and generally not for more than a few days. We frequently see people back at work or school on the day following surgery, even when all four wisdom teeth have been removed. If you have dissolving stitches they can take as much as 2-3 weeks to dissolve. More often if you have stitches you have the kind that need to be removed in a week. When can I take the gauze out that I was biting on when I left the office? The gauze may be removed when you get home, to be replaced with new gauze if significant bleeding continues, or if it feels better to have gauze in place. If the bleeding is not tapering off within a few hours of surgery, you should call the oral surgeon. A small amount of blood on your pillow on the night following surgery is nothing to be alarmed about if there is no active bleeding. If I’m a smoker, how long should I wait to smoke after surgery? Smoking is harmful to the healing process and makes numerous complications more likely. If you must smoke, avoid it for the first 48 hours after surgery. Consider a nicotine substitute in this short period: gum, patch. Treatment of impacted wisdom teeth requires skill on the part of the dentist, a well trained staff and a surgical facility equipped for emergencies. Although many general dentists remove impacted wisdom teeth, I prefer to have our oral surgeon who does this regularly perform that service for my clients. Oral surgeons are specifically trained to perform these procedures and have the knowledge and experience to handle any situation which might arise pre-operatively, intra-operatively and post-operatively. Most importantly they have the supportive staff and facility to accomplish the surgery safely and expeditiously. The removal of wisdom teeth is usually performed on an outpatient basis in the oral surgeon’s office. Click here for information about our oral surgeon. There are many good reasons for removing wisdom teeth. There are also some risks and complications that are possible when extracting these teeth and sometimes there are some good reasons for leaving them alone. The decision on a specific course of action must be determined by a well informed doctor and client working together. The normal precautions, risks and benefits of extraction of any tooth should be discussed with the oral surgeon prior to beginning any procedure. After surgery, a 48 to 72 hour recovery is expected. Maximal swelling and discomfort usually occur 48 hours after any surgical procedure. Following post-operative instructions is important to preventing or alleviating most common potential complications (click here for post-operative instructions). 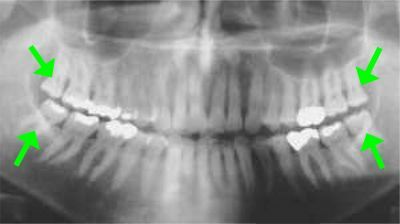 Some potential complications, whether rare or common are possible in all extractions, while others are unique to the removal of wisdom teeth. Swelling (also known as surgical edema) is to be expected post operatively. Swelling can last for several days and can be significant in some patients. The exact amount of swelling varies from person to person as does the time required for complete resolution of the swelling. Swelling is a normal consequence of surgery and also normally resolves without extraordinary measures. Steroids given at the time of surgery are a most effective weapon in the battle against swelling. Bruising is not likely; however, it can be more common with difficult impactions, and if it occurs, will rapidly diminish after the first week. See more, click here. Bleeding is expected post operatively and can continue up to 10 hours after any procedure. Even a little blood seems like a lot in the mouth due to a mixture with saliva. Saliva can increase what appears to be high concentrations of blood by 10 times. Nausea and vomiting are not common, and are a side effect experienced often as a result of the IV anesthetics. Today’s medications make this less likely. Removal of third molars is a surgical procedure and some discomfort should be expected. It is also reasonable to expect that this discomfort will be taken care of by the pain medication prescribed. The degree of pain anticipated is often proportional to the difficulty of the surgery, and conversely is decreased with the skill and expertise of the oral surgeon. Trismus is pain in the muscles surrounding the jaws which affects the function of the jaw joint, often limiting opening of the mouth. These muscles are used during opening and closing of the jaw and can be aggravated post operatively by overeating, grinding, and heavy chewing. If treatment is required, it is usually conservative in nature and includes anti-inflammatory medicines, physical therapy and in some cases short term bite splint therapy. Infection following the extraction of wisdom teeth is not a common complication. Natural immune mechanisms help to protect the surgical site. Any infection, however, should be taken seriously and reported to the oral surgeon. Signs of infection include fever above 100 degrees, abnormal swelling, pain or prolonged bad taste, with or without evidence of discharge from the surgical site. Infections if they occur are usually minor, but they can lead to more serious infections of cellulitis, endocarditis, and brain, liver or heart abscesses. Some people will experience localized inflammation and infection in the tooth socket 48 hours after surgery. This has commonly been called a dry socket (alveolitis). It is not dry, however, and the name is derived from the clinical appearance of the socket which is commonly void of a normal blood clot or granulating (healing) tissue. Statistically, it is more common in people older than 25 years and in women. It is also seen more often in people who had to have their tooth removed than people who elected to have them removed. Alveolitis will occur in one to five percent of people regardless of the surgeon’s skill or surgical method chosen. A dry socket is typically the result of something that has dislodged the normal blood clot, such as smoking, drinking through a straw, brushing the area, or trying to clean the extraction site. Occasionally root tips remain after the removal of wisdom teeth. Usually the fragment is close to a nerve or adjacent sinus. Removal of the root tip could jeopardize adjacent structures. The oral surgeon uses clinical expertise to determine the benefit to risk ratio of removing a root tip. Since root tips uncommonly cause post operative infections or pain, their removal is not an absolute necessity. The fragments can be monitored using x-rays. Fragments can be removed in the future if they cause problems that can be detected or felt. Damage to fillings and adjacent teeth, to bridgework or to surrounding bone can occur during the removal of impacted wisdom teeth. Even the best surgery will occasionally have this type of complication, although every effort is made to avoid it. In very rare cases, the removal of a wisdom tooth can weaken the jaw bone. 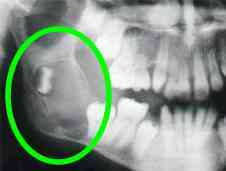 This is due to the necessary removal of bone to obtain access to the impacted tooth. It is very rare for the jaw to fracture during the removal of a wisdom tooth. It is also very rare for the jaw to fracture after the removal of a wisdom tooth due to weakening and chewing normal foods; however, the oral surgeon may indicate that a large amount of bone was removed to gain access to the wisdom tooth and that likelihood of fracture is increased. If the potential for fracture is increased, the oral surgeon may recommend that the person avoid eating hard foods which may place undue stress on a weakened jaw until complete healing takes place (about 4-6 months for bone). In some cases the lower wisdom teeth have roots that lie very near or even wrapped around the inferior alveolar nerve. This is the nerve that supplies feeling to the lip, teeth and tongue on each side of the mouth. Occasionally, when a lower wisdom tooth is removed, that nerve will be bumped or bruised and if so a change in sensation may be noted on that side (paresthesia: lingering numbness). It is important to understand that this is a sensory nerve and does not affect the ability to move the parts of the oral cavity to which it gives sensation (feeling). In most cases, the nerve heals itself but, because nerves heal slowly, it may take six months to one year before return of normal sensation. Very rarely, the damage to the nerve is permanent. The upper wisdom teeth have roots which often are separated from the maxillary sinuses by only a very thin layer of bone. Occasionally, a small opening is created between the sinus and the oral cavity when one of the upper third molars is removed. If this occurs, the normal procedure is for the area to be sutured closed, the person to be informed of the finding, appropriate antibiotics and decongestants to be prescribed, the person to be instructed to avoid Valsalva maneuvers (tasks which build up pressure in the sinus like nose blowing and bearing down forcefully) and reappointed for follow-up. Most often this results in an uneventful healing period with no further treatment being required. Occasionally, the area will heal open rather than closed in which case an additional small surgical procedure will be required to close the opening.